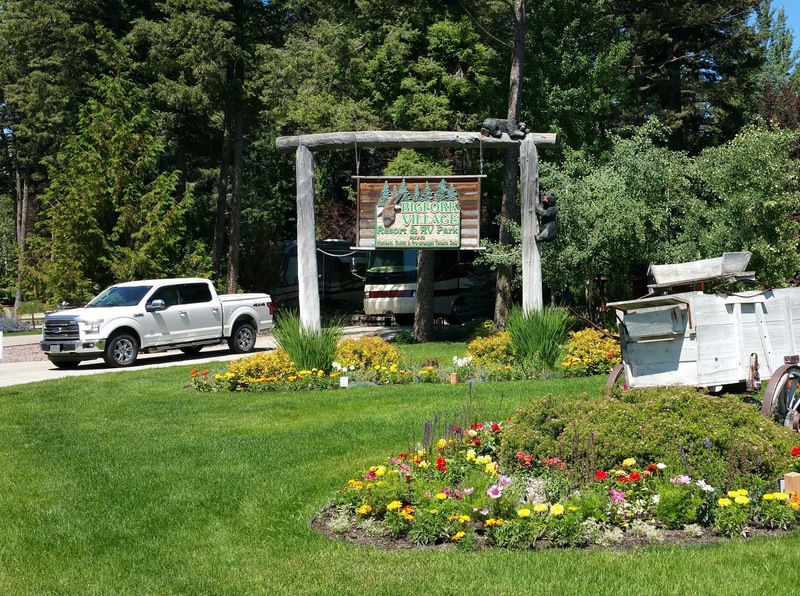 From Bigfork Motorcoach Resort in Bigfork, Montana, Bella Terra Motorcoach Resort of Gulf Shores and points between. This is a hard to write post. I started it in August 2016... finished it in May 2017. It's long too. 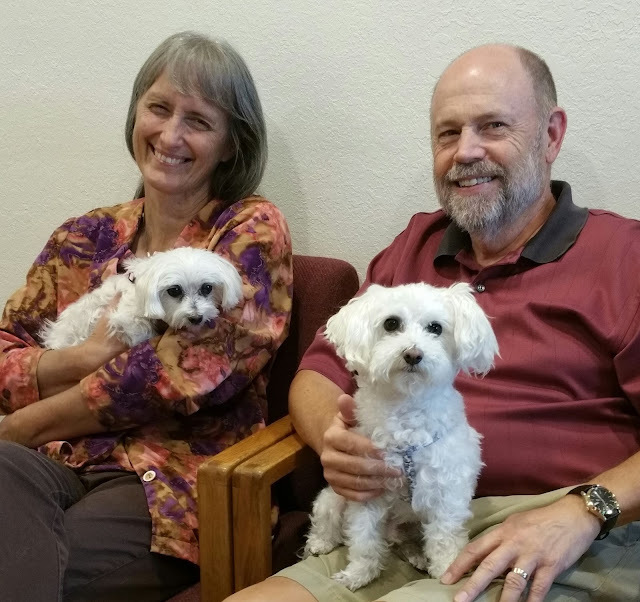 Less than a month later though, Lexie's pain returned while we were in Camp Verde, Arizona. 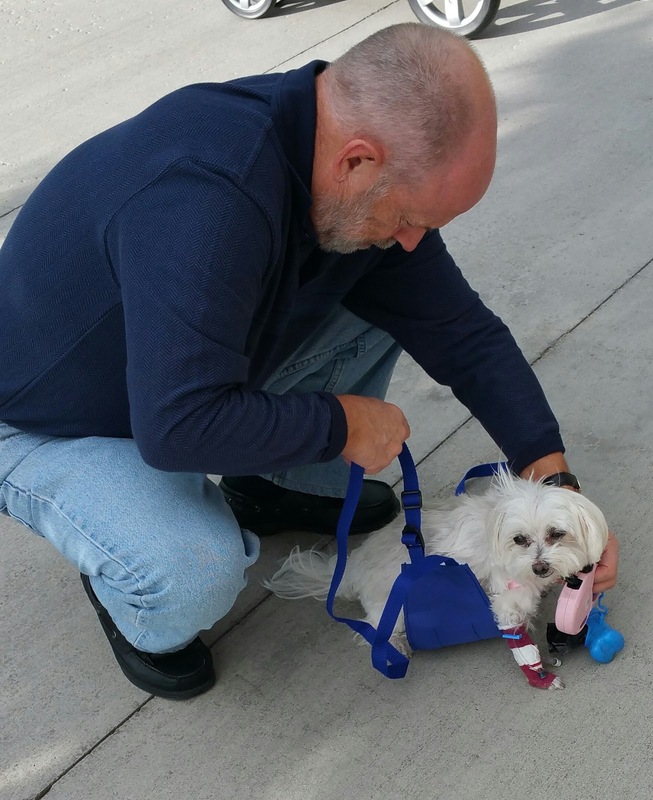 Rushing her to nearby Montezuma Vet Clinic, Dr. Jennifer Boyd prescribed more tramadol and gabapentin to reduce her pain. A longer prednisone treatment was prescribed following blood tests and another ultrasound. Discussions of her painful history, her age and a common malady of her breed, Inter vertebral Disk Disease (IVDD) was suspected but couldn't be diagnosed with certainty. I researched IVDD, spoke with friends who had experience with pets suffering from it and felt certain it was Lexie's problem. I administered prednisone like clockwork so she could rest and recover. 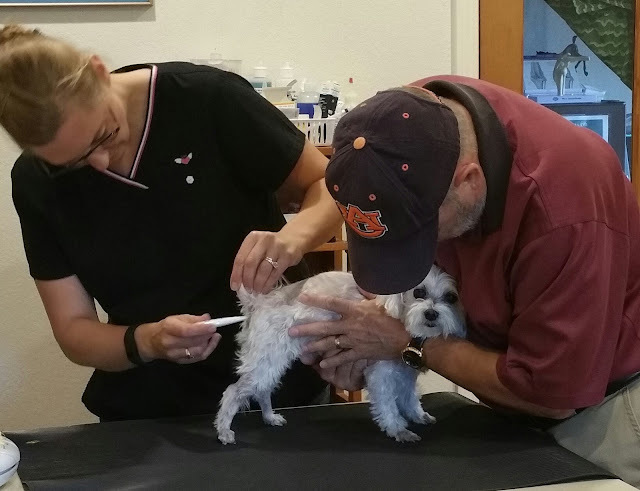 The fourteen day steroid treatment was extended (with guidance from the vet in Camp Verde) long after we left the area. 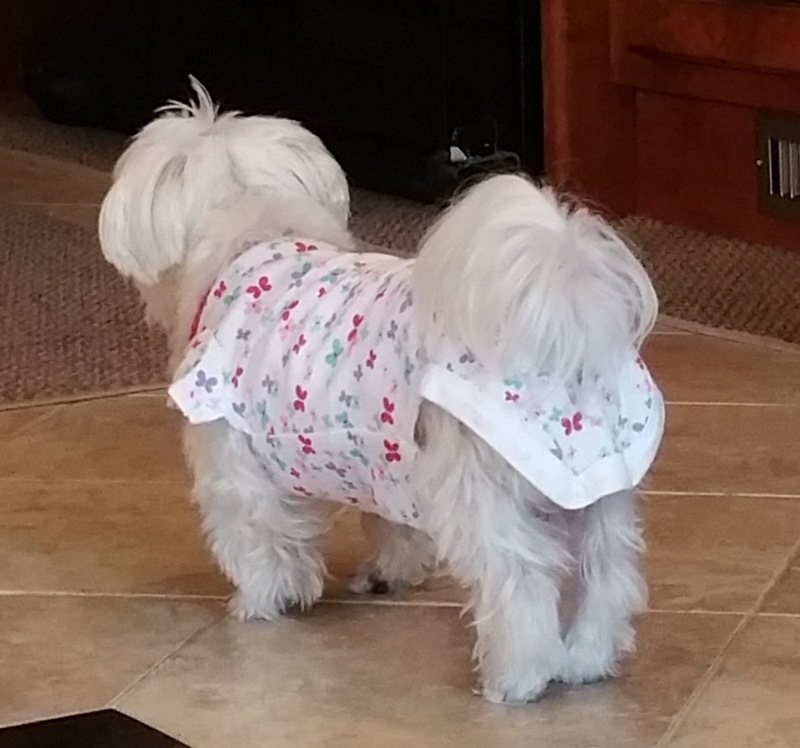 Lexie's painful symptoms reappeared within 48 hours anytime we stopped the steroid. 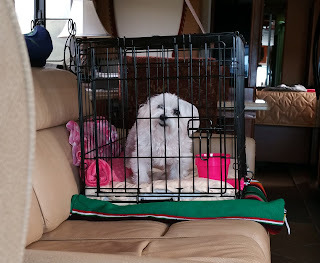 Strict crate rest was started mid May (as instructed by the Camp Verde vet) while we were in Park City, Utah. Alternating day steroid treatments, along with rest, continued until the first week of June when we reached our summer destination at Bigfork, Montana. 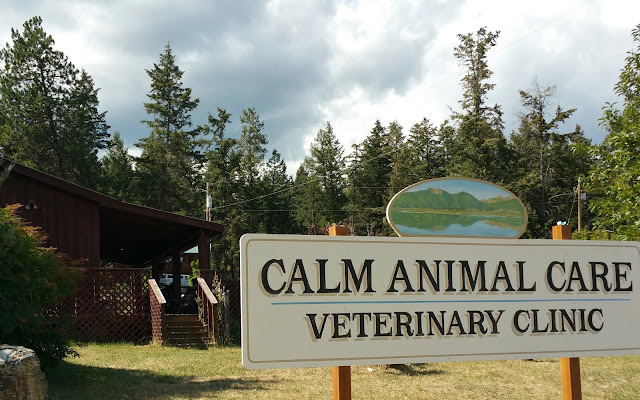 Eager to get a clearer diagnosis of Lexie's condition along with alternative treatments (in which I placed my hope now) I found a veterinarian who performed acupuncture at Calm Animal Care in Kila, Montana, 30 miles or so from our campground. Calm Animal Care practices in the little brown building on the left. Just look at this lovely rural setting and Ponderosa pines. Owner of this Kila, Montana practice is Barbara Calm. Really, that's her name. Early the first day at Bigfork, I called for an appointment at with Barbara Calm, DVM at Calm Animal Clinic. She is a well respected animal acupuncturist but she was out of the office for ten days. Unstable on her feet and moaning in pain, I asked if someone else could see Lexie. We went in immediately and saw Meg Gordon, DVM. That examination resulted in the removal of all steroids for 72 hours, then the introduction of Novox (an NSAID) in its place along with the tramadol, gabapentin and continued crate rest. A definite diagnosis still eluded us though. The most humiliating part of the exam. Pop assists. "Mom, put that camera away!" We followed Dr. Gordon's instruction to the letter, but three days later, as Lexie's moans grew louder and her rear end grew less stable, we returned to the clinic for yet another examination. This time with Karen Hartle, DVM who called for another full compliment of blood work, xrays, urinalysis and ultrasound -- and the addition of a possible hernia and kidney stone diagnosis possibly exacerbated by luxating patella. Still the IVDD, suspected some 90 days earlier, couldn't be absolutely diagnosed upon close examination of the xrays. I scoured each picture alongside the doctor. 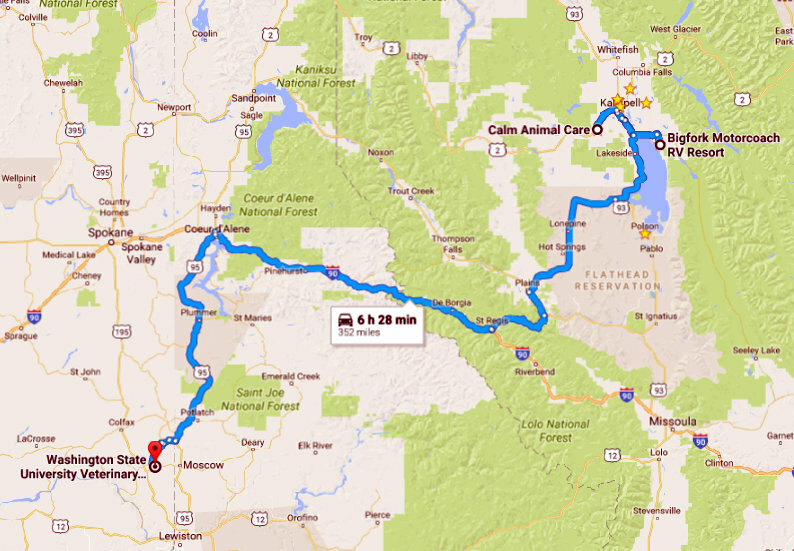 In the end, Dr. Hartle referred Lexie to Washington State University Veterinary Teaching Hospital in Pullman, Washington -- some 300 miles, 6 hours away. Crate rest continued. The second visit to Calm Animal Clinic. Waiting for test results. She is an instructor, WSU Vet School ER and ICU Critical Care Vet. She also is our WSU Vet School champion. So on Monday, June 15th, three months after Lexie's first painful symptoms, Wayne and I packed a bag, loaded our entourage into the truck and headed to Pullman, Washington. Dr. Angela Nguyen in ER., ICU and Critical Care services listened intently as we described what we observed in Lexie. Dr. Nguyen proceeded to give Lexie another complete workup. We took a room at the local Holiday Inn for two nights while WSU's Internal medicine, orthopaedic, radiology, rehabilitative services and theriogenology teams performed exhaustive exams of Lexie. In the end, their findings were "urinary tract infection," some "possible mild muscle atrophy" and "decreased resistance to hip extension and bilateral Grade 1 luxating patellas." Lexie was given an acupuncture treatment. 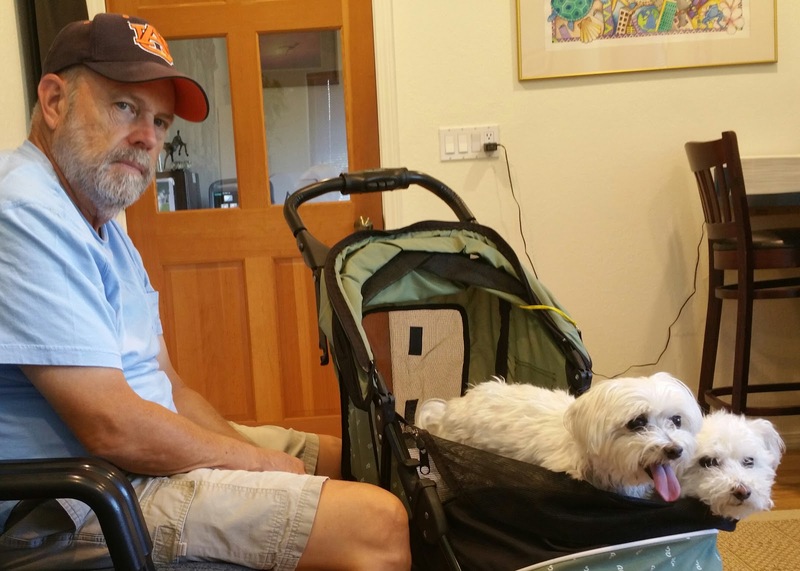 No test, except MRI, were spared to pinpoint Lexie's pain. We talked about having the MRI, but decided against it given Lexie's condition and age. Everyone hoped we were onto something now. 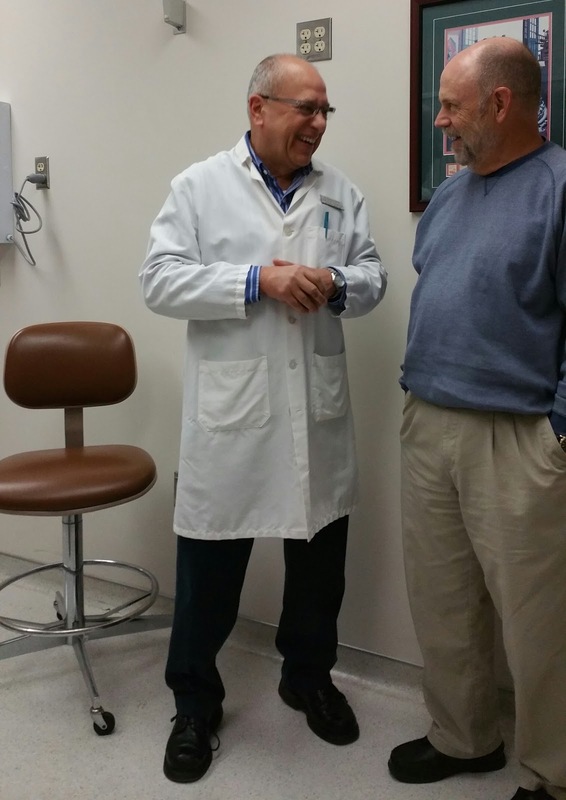 Mushtaq Memon, BVSc, Ph.D., Theriogentologist at WSU shares some humor with Wayne. Wayne needed some humor by this time. 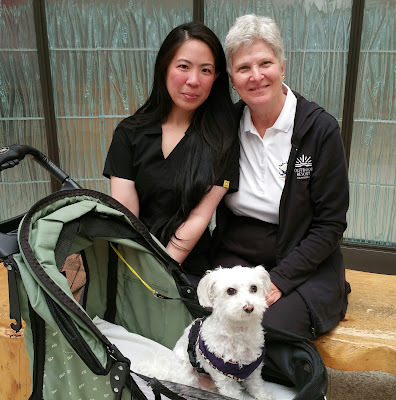 While at WSU, Lexie received one acupuncture treatment and laser therapy with recommendations to continue these sessions with Barbara Calm, DVM in Kila and to begin administering Chinese herbs. We returned to Bigfork with new bottles of omeprezol, tramadol, gabapentin, clavamox and a new NSAID, Metacam, making a demanding "every 8 hour" regime for Wayne and me. It wasn't easy administering all the meds... empty stomach, with food, every 8 hours and so forth. It was a challenge... and I hadn't even looked into the Chinese herb therapy yet. Ozzie always waits with us. 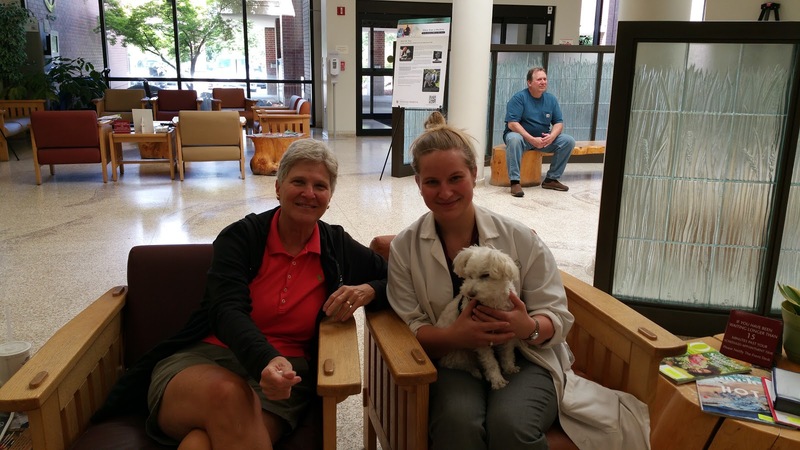 Here, we're joined by Janne Lyngby, DVM, MS Small Animal Internal Medicine Resident who is charged with Lexie's case. On the fifth day after discharge from WSU, Lexie returned to Calm Animal Clinic, for her first acupuncture treatment from Barbara Calm who called us in 45 minutes late with an announcement that she is chronically late to appointments and is a musician. She attributed her tardiness to being such an optimist. Funny thing, I'm an optimist and I'm always on time. Dr. Calm followed the first statement by saying she was running late for a music appointment. I suggested we reschedule as Lexie's condition is the most important going in our life at this time. Dr. Calm realized our serious concern and insisted that we would not be shortchanged on acupuncture treatment visits. We visited briefly to review Lexie's history to this point in time and then Dr. Calm performed her first acupuncture treatment. She reduced Lexie's Metacam dosage by 2/3 and told me to start her on "Harominize the Qi" a Chinese dietary supplement. The acupuncture seemed to help. Crate rest continued... now into seven weeks. Lexie's walk was almost normal for the first few days after but 6 nights later I was awakened by the sound of panting and moaning. She was pacing all over the bed, walking across me -- something she never does, and had begun trying to bring her rear foot up to scratch her upper body every few minutes. Additionally she had begun gnawing at her groin / mammary area. Next morning, a consult call to Calm Clinic in Kila let to a second visit to the teaching hospital at WSU in Pullman. Lexie had a 10 a.m. appointment the next morning in the neurology department. As is customary at a University teaching hospital, we were again assigned a 4th year vet student. Julia examined Lexie and reviewed the history, comparing it to the file she had from our first visit. We shared details of Lexie's new symptoms and were in great hopes we would find answers. 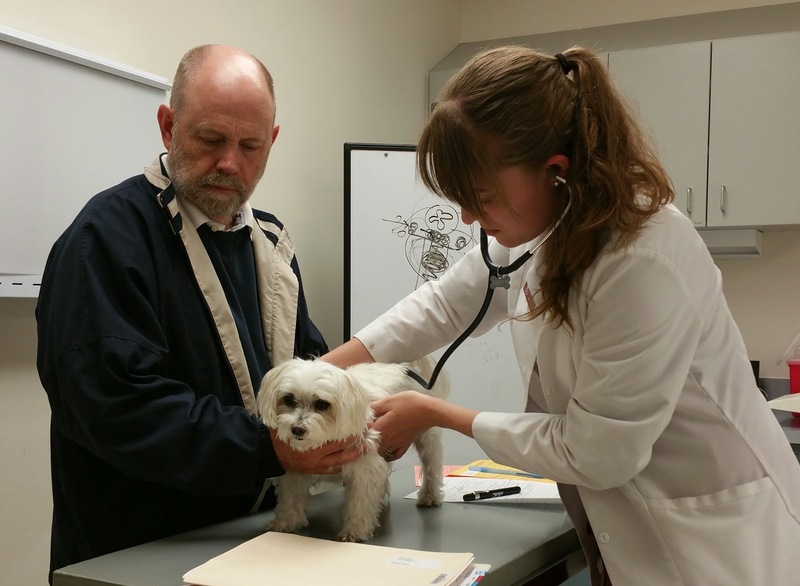 Upon examination by WSU Vet School resident neurologist Tom Jukier, Lexie was returned to our care with his surprise diagnosis of food allergies and luxating patellas. I gasped when I heard it but we listened intently to his explanation and felt our concerns were falling on deaf ears. Perhaps they all thought we were just crazy hypochondriac dog owners. We accepted the diagnosis, bought a few cans of Hills Science Diet Z/D special food allergy food and said we would discontinue all of the medications we had been giving Lexie, per the instruction. That was June 24th -- well into the third month since Lexie first showed signs of pain. We drove the 300 miles back to Bigfork wondering if we might have been wrong.... could this "food allergy" diagnosis be right? Wayne was beyond skeptical. Lexie ate only the Hills Science Diet Z/D food for the next few weeks but she ate it with her usual gusto. 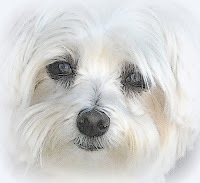 We ordered a case of the canned bland food and we both watched to see possible changes in Lexie -- good or bad. During this time, I made notes on the margin of my calendar noting that Lexie had begun walking sideways and was terribly unstable. She stopped drinking water and began to urinate and occasionally defecate in the floor. She fell of the sofa when left unattended and seemed to wander aimlessly on the floor, carrying her head low. She no longer barked. We waited and watched, unsure what to do.The only time we saw any trace of the "Old Lexie" was when she became excited at mealtime. Then, on on the morning of Thursday, July 7th, everything changed when Lexie froze in place with one paw extended upward, while out for a short walk. We jumped into the truck immediately and headed to Dr. Calm's clinic in Kila. By now, these three doctors had become our strongest advocates, though I felt sure they thought we were crazy. 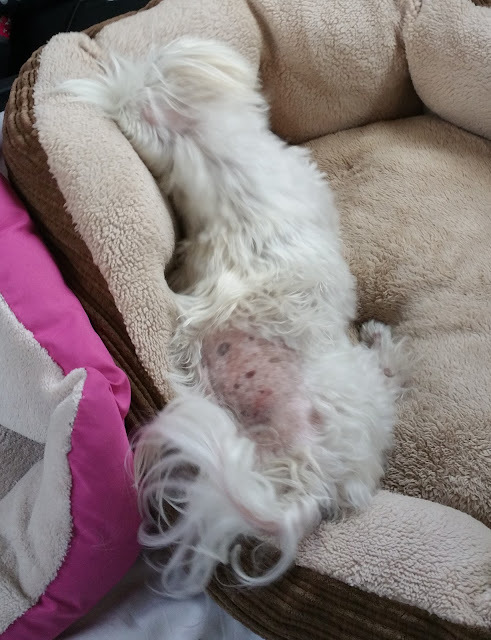 As Wayne raced along the country roads, Lexie had clusters of seizures, one after another. Her eyes were glazed and her little body was stiff during the seizures. As they subsided, her breathing was rapid and she panted wildly. When the seizures finally subsided, her body was lifeless except for her heavy breathing. Dr. 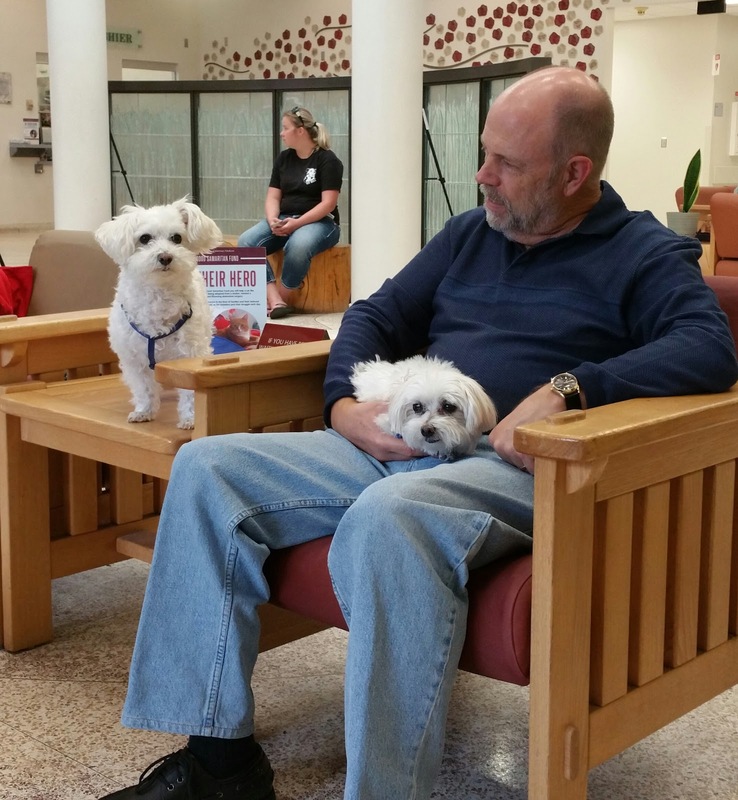 Calm began an iv and did blood work within minutes of our arrival. She and her staff were bewildered and told us so. We recapped the two visits to WSU. Dr. Calm suggested the seizures might never recur and could have been triggered by almost anything. She explained the difference between petitmal and grandmal seizures and she gave us her best theory as to what was happening. We discussed, in amazement, the most recent food allergy diagnosis from the second trip to WSU. We all watched and waited for another seizure but no more occurred. Wayne, Ozzie, Lexie and I stayed all day in Dr. Calm's office but nothing else happened so we went home armed with three syringes and a tiny bottle of anti-seizure medication that I was to administer if Lexie went into seizures that lasted more than three minutes. There were no more seizures all that day and we almost breathed a sign of relief hoping it was a one-time event. An afternoon in Dr. Calm's private office. But that was too good to be true. That evening Lexie's seizures began again. One just before bedtime and four or five in rapid succession during the night. None lasted the full three minutes so the anti-seizure shots were not administered. The next morning, I called Dr. Calm. I was in tears. We had to give WSU another chance. There was nowhere else to turn and we were losing Lexie. Dr. Calm agreed. Next I called Sally Anderson, in the Neurology Department at Washington State University to tell her we were on our way. Sally made sure Lexie would be seen. The video below is Lexie in a full blown seizure. Be Warned. It is hard to watch and lasts 4+ minutes. I pre-loaded the three syringes with the anti-seizure medication and we began our third 300 mile trip to Pullman, Washington from Bigfork, Montana. The ride was brutal. I kept a constant eye to the back floorboard of the truck where Lexie and Ozzie were riding. By now, we knew the route so well. The first 1/3 of the trip through Montana along the rivers edge to St. Regis, Montana where the journey's second third began along Interstate 90 west to Coeur de Alene where we encountered the hardest part of the trip along the mostly 2-lane road south to Pullman, Washington. To our dismay, Lexie did not have a single seizure during the trip and we reached WSU mid-afternoon of Friday, July 8th. The Emergency Room physician, Angela Nguyen, whom we had met in our first visit, looked at Lexie immediately and could hardly believe she was looking at the same little girl she'd seen less than a month earlier. Another thorough examination began and we all agreed on an MRI for Lexie at the earliest opportunity. Lexie was started on Levitracetam (Keppra) an anti-seizure medication at 8 hour intervals and the MRI was scheduled for Monday morning. I hoped an MRI would be done immediately, but the doctors assured us Lexie's condition was stable and she was no real urgent danger.They explained that fresh minds and hands and a full staff on Monday would be to our advantage. Lexie was returned to us for the weekend with the understanding that we could return to the hospital ER at any hour if she went into seizures. We checked into a hotel and settled in for the nerve wracking weekend. Lexie would sleep in her stroller on my side of the bed, in case of seizure. The video below was taken in the hotel room on Friday night after we left WSU. Note how Lexie's rear end lack of control. She still is loving that food though. Sure enough at 11:30 we were awakened by the horrible screams of Lexie in the stroller. I frantically administered the anti-seizure shot as Wayne held our exhausted little girl. I called WSU and we rushed her back to the waiting medical team. The tech on duty assured me Lexie was okay though she sure seemed near death as I handed her near lifeless body over. In a few minutes a very tired Dr. Angela Nguyen emerged to let us know that Lexie was okay. She reviewed a few details of having Lexie admitted through ER for observation for the rest of the weekend. 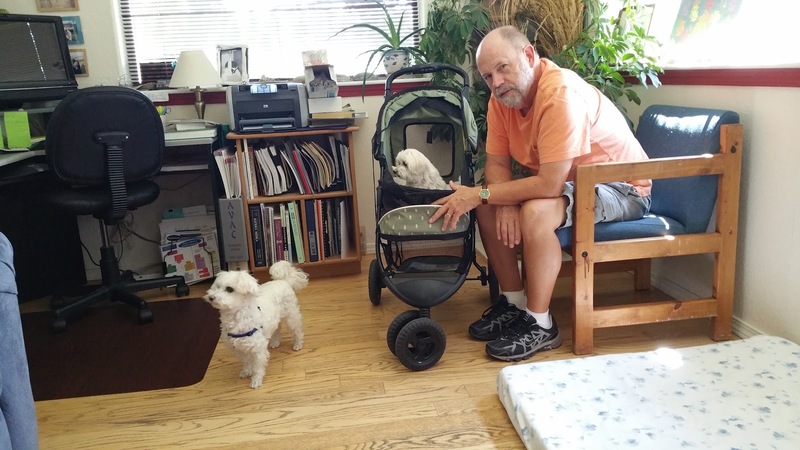 Wayne, Ozzie and I returned to see her Saturday and Sunday and each time she looked worse, weighed less and had less control of her rear legs. We all were suffering. Sunday was the worst day. We held her little limp body, tried to let her walk and attempted taking her for a ride in the stroller. This was almost more than we could handle. 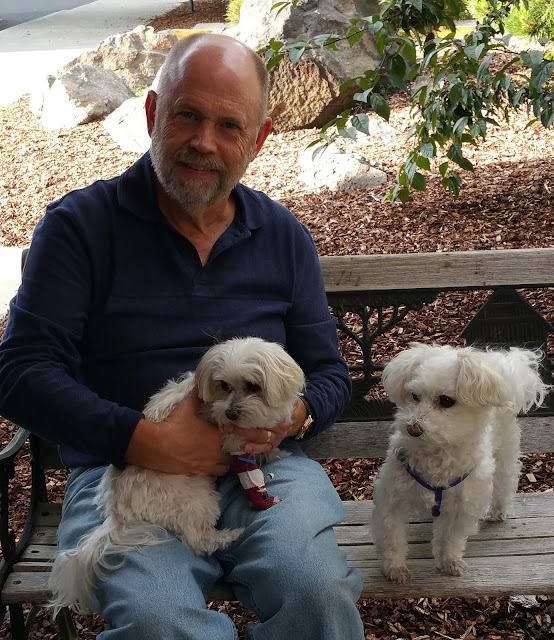 Pop with Lexie and Ozzie sit on the porch at WSU Vet School. Her foot isn't bloody. It's a red bandage holding the IV in her leg. The good news is that she never lost her appetite. She can't stand but she can eat. Finally Monday morning, July 11th arrived. The MRI was scheduled for 10 o'clock. Dr. Angela Nguyen (who we really liked by now) called to let us know that Lexie was fine and the MRI was on schedule. Lexie did have a seizure a few hours earlier but it was controlled quickly. We held our breath and tried to busy ourselves riding around town, stopping in at one of the department stores and eating late breakfast. 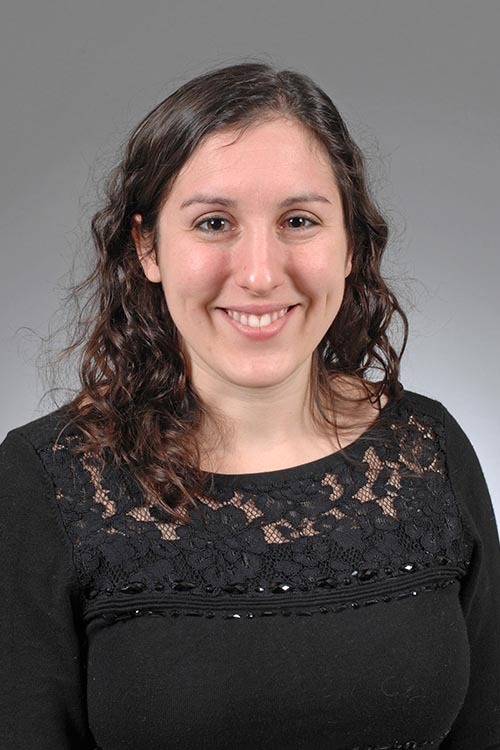 By 10:45, the Neurologist, Dr. Sasha Dixon called with the encephalitis diagnosis. A spinal tap had been done. The evidence was clear and undeniable. We were thrilled that it was not a brain tumor. The neurologist invited us to view the images and the white area of Lexie's brain was clearly visible. Now what? My joy turned immediately to devastation as the neurologist explained that encephalitis dogs lived, on average, two years, after diagnosis. She saw my horror I know and I think she regretted her bluntness. I concluded that the average two years could be expanded when coupled with our love, attention to medication detail and sheer determination. Two days later, Lexie left WSU in Pullman for the last time with a half dozen prescriptions. All four legs had been shaved and showed signs of having the iv tubes inserted. A small area at the base of her skull, her tummy and a 4" square swath on her back (near her tail) were shaved too. But she was beautiful. She weighed just over 6 pounds, a loss of more than 2 pounds. Negative fungal, bacterial and insect born test results allowed us to drop two or three prescriptions soon after but a hefty regime of meds for inflammation, pain and seizures will stay with us forever it seems. Unable to stand easily without assistance, Lexie is clearly happy to be with Ozzie. Fourth year vet student Serena Swan, explains the meds and gives us a happy sendoff soon after this picture was taken. but I think she felt good the day this picture was taken. We were leaving Pullman for the final time. A "onesie" will protect the pink skin on her back from getting burned by the sun. I cut a whole in the seat for her tail. Lexie's recovery was quick, beautiful and without incident. She regained the pounds she lost and never missed a beat on her short walks. So much prednisone caused her hair to thin but she recovered. We stayed in frequent touch with the folks at Calm Animal Clinic as they would monitor Lexie's progress and communicate with the Dr. Dixon at WSU for the next 60 days or so. Finally on August 24th, we returned to Calm Animal Clinic for a final exam, including blood work, to be sure Lexie was well enough for our journey south where Auburn's Vet School would take over her care. 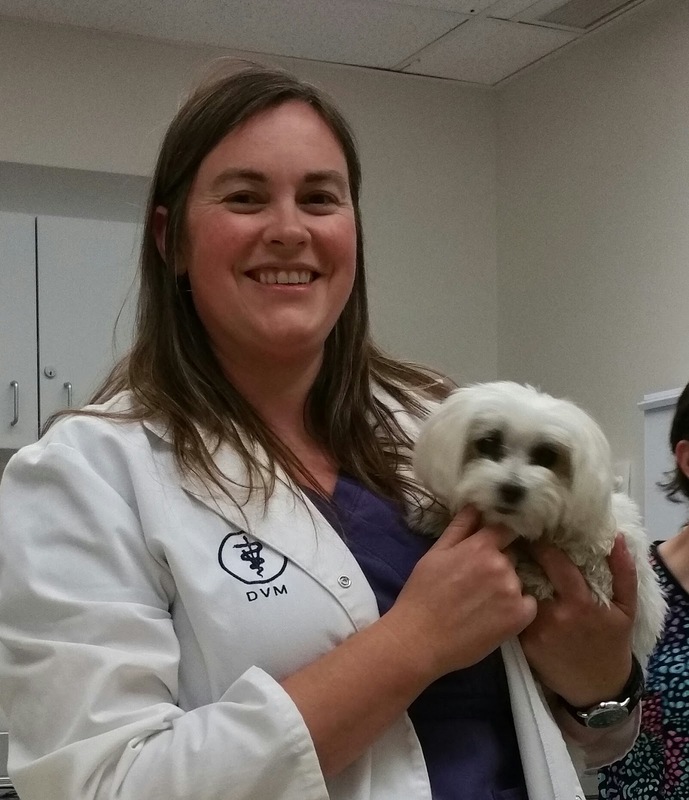 Dr. Barbara Calm holding Lexie while Wayne holds Ozzie. 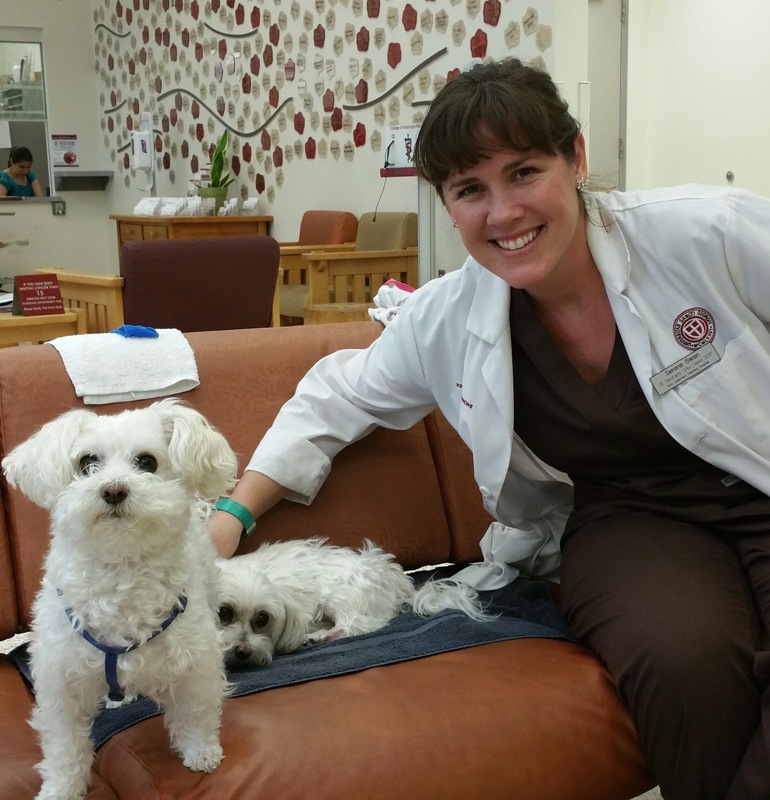 It was a long and frightening journey for us but in the end, Lexie and Ozzie both managed to lose their fear of the veterinarian office. This post, begun long ago, is finally finished this last day of May 2017. Lexie is well and happy. Ozzie too. Wayne and me too. Of particular peculiarity... I've read that encephalitis is common in Maltese yet none of the dozen or so veterinarians, including two neurologists, mentioned it's possibility. Fascinating and bewildering. 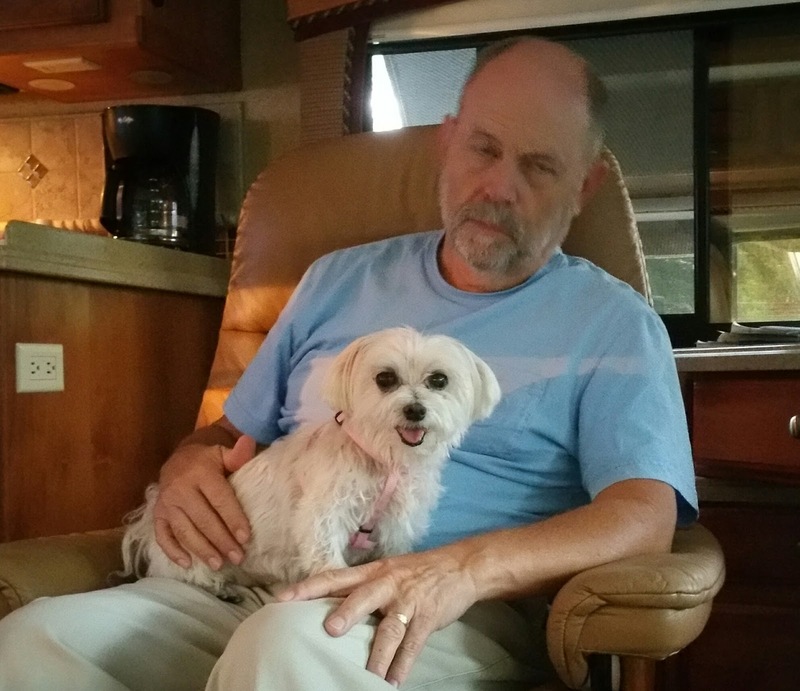 Sleepy Pop and Happy Lexie -- two months after the diagnosis! Such a terrifying ordeal for all of you. I am so glad she is doing so much better. And yes we do everything we can for these totally loving creatures that are a part of our hearts. Enjoy every minute with them.